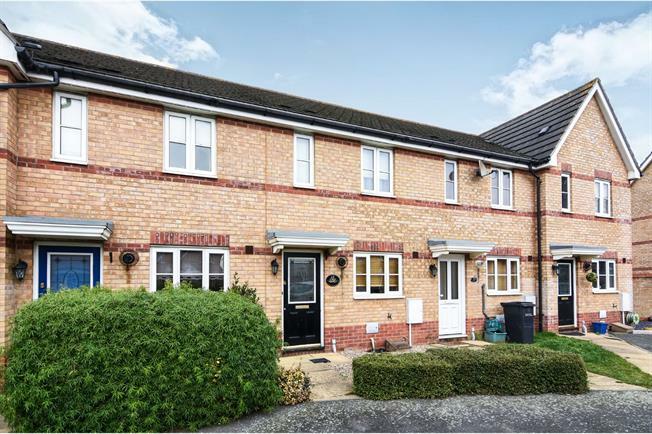 2 Bedroom Terraced House For Sale in Braintree for Guide Price £200,000. This freehold two bedroom property would ideally suit a professional couple or small family. With a big sitting room at the rear, separate kitchen and two decent size bedrooms. The enclosed rear garden is mainly laid to lawn with fenced boundaries and planted borders. There is a timber shed at the back of the garden which will remain at the property. To the front there is allocated parking as well as additional visitor parking. The entrance hallway leads from the front door to the kitchen and rear reception room., offering a welcome break from the living quarters and the elements outside. This large and versatile room is at the rear of the property with views over the garden and French doors for access. There is comfortably enough room for living room furniture and a family sized dining table and chairs if required. The stairs lead up to the first floor. Located at the front of the property, the square kitchen offers a range of units and space for all white goods (some of which are included in the sale). The front window allows for a pleasant view whilst doing the dishes! The huge master bedroom is at the rear of the property with views over the garden, there is storage above the bulk head and a handy recess for wardrobes. The second room is the full width of the property and could take a double but would be more comfortable as a generous single bedroom. The three piece bathroom suite comprises; low level WC, panel enclosed bath and pedestal wash hand basin. The enclosed rear garden is mainly laid to lawn with fenced boundaries and planted borders. There is a timber shed at the back of the garden which will remain at the property. To the front there is allocated parking as well as additional visitor parking.